Home / Blog / Social Media / Is Engagement the Biggest Hammer for Social Content? in Social Media with tags Facebook, KPIs, shopper marketing, Social Code, social content Both comments and trackbacks are closed. For years, marketers have been using engagement KPIs as the hammer of success in social channels. In the last six months, however, Facebook has led the revolution in paid social by shifting to a platform where marketers can achieve greater scale and attribution for ROI. By now, this change is old news — but it is sparking conversation around whether or not engagement even matters at all anymore. 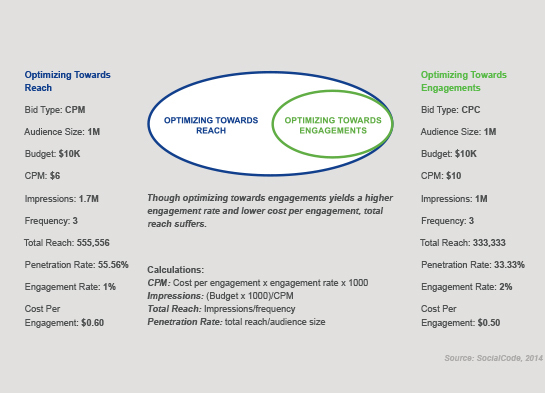 SocialCode recently released a report around this very topic, which argues that although engagement still matters, marketers are better off optimizing their paid buys toward audience reach and looking to engagement KPIs as an indicator of higher-quality creative. If stronger engagement equals more effective creative, should marketers use this metric as a proxy for real-time copy testing in social? The short answer is no. Sure, optimizing is a no-brainer since one of the biggest benefits of looking at post engagement is that it happens in real-time and there is no waiting for a post-analysis or topline report. But beyond real-time optimization, marketers should also set out with a larger learning agenda because an engagement analysis can be an efficient way to take stock of the everyday role that a brand is playing in people’s lives (and even their pantries). Content Effectiveness: Did version A or version B of your content resonate more? Think about what you can infer from KPIs like commenting, sharing, liking and tagging friends, and extrapolate as to what the results across each might mean for your message. Additionally, ask yourself: Is the main message translating well to this distinct audience (i.e. are they getting the message)? Listening to fan comments is a great way to answer this question. Fit: Is your social content causing an overwhelmingly positive or negative reaction? The sentiment linked to consumers’ comments is critical understanding for any real-time message optimization. Innovation: Is your content sparking relevant or tangential branded conversation that could inform product optimization or innovation, or perhaps trigger new content development? Validation: Is the content validating other consumer research or learnings, or is it perhaps unlocking new opportunities? Motivation: How is consumer targeting playing a role? Are the motivations of purchased-based targets different than other affinity-based targets? With Facebook’s purchase-based targeting capabilities, evaluating “Shopper” versus “Fan” engagement ties activation more closely with business objectives like household (HH) penetration or buy rate. It’s probable that marketers will find wildly different consumer motivations for the same message when targeting different shopper segments. For example, observing a segment that “tags” their friends as a result of new product news indicates that a brand can move the needle with them at shelf. In some recent work for a Kraft Foods brand, 360i has been able to apply engagement insights to optimize against various purchase-based “Shopper” targets and better inform everything from rational versus emotional product RTBs to future innovation opportunities and content strategies. Taking an always-on approach to engagement analysis uncovers the right insights that can help marketers build effective social content strategies and campaigns. The sharpest brands understand that engagement is the biggest hammer in their content toolbox — especially in a world where every social media impression is a nail. Now, it’s just up to agencies and marketers to continue making the right creative blueprints to guide their branded content.